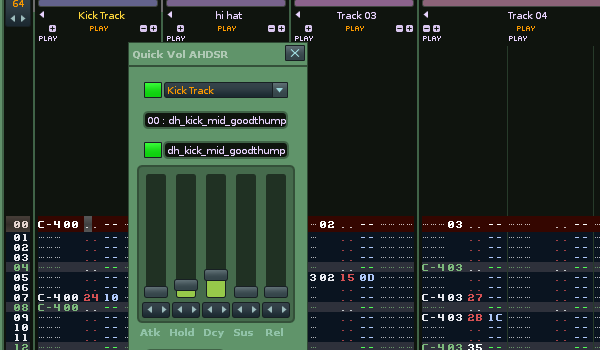 When building up a beat in renoise with simple one shot samples, it can be a job to keep going back and forth to the sample editor to add and adjust the all important Volume AHDSR envelopes. This tool gives you a GUI for use on the fly as you add new samples into your beat and adjust how their dynamics are all interacting. You can simply add new AHDSR envelopes with the enable checkbox (bottom left). You then have access to that envelope from its GUI. Continue to use the checkbox to bypass and enable the envelope as you wish. The GUI updates continually on a timer and always shows the envelope for the selected renoise instrument. Global:Tools: "`QVA `Quick Vol AHDSR"
Menu entries are also available under the tools menu and the instrument list.